Rated R for pervasive language, a scene of sexuality and a violent act. Brandon Lang loves football: an injury keeps him from the pros, but his quarterback's anticipation makes him a brilliant predictor of games' outcomes. Needing money, he leaves Vegas for Manhattan to work for Walter Abrams advising gamblers. Walter has a doting wife, a young daughter, and a thriving business, but he has problems: a bum heart, a belief he's a master manipulator, and addictions barely kept in check. He remakes Brandon, and a father-son relationship grows. Then, things go awry. Walter may be running a con. The odds against Brandon mount. A sampling of the ugliness of the sports gambling life ensues..., 6 October 2005 Author: (johnny_betts@hotmail.com) from http://www.themoviemark.com Networks can't talk about it. The government can't tax it. Yet sports betting is a $200 billion a year business. 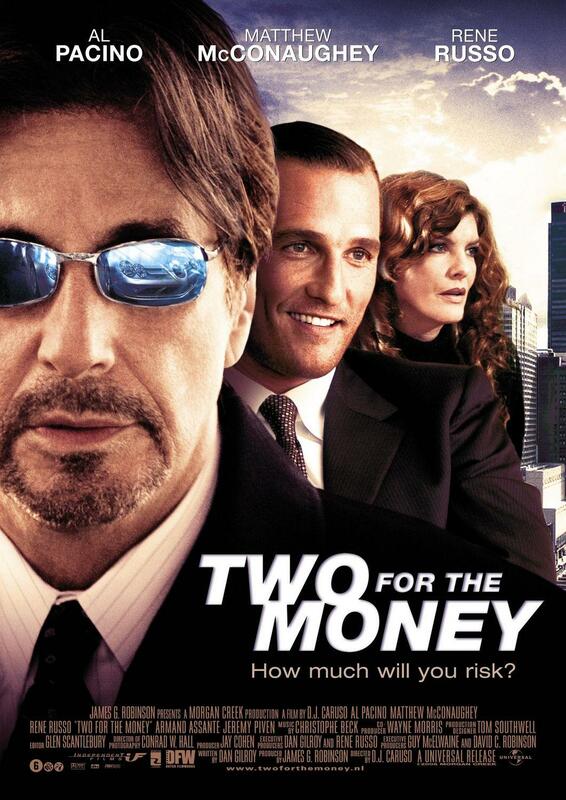 A business that strives to exploit every vulnerability, manipulate every gullibility, and convince the client that it can provide them certainty in an uncertain world.Two for the Money is the story of one man's journey into the sports gambling world. Matthew McConaughey delivers one of his more impressive performances as he transforms from Brandon Lang, the smooth-talking golden boy, into John Anthony - "The Million Dollar Man with the Billion Dollar Plan." A transformation that comes complete with a new suit, a new car, a new attitude, and slicked back hair - a sure-fire movie sign that corruption or a loss of innocence is imminent.Portraying a character that must deal with this corruption of innocence, McConaughey demonstrates that he can act with more than just his dimples and down-home Southern charm. Lang is a machine. He knows the teams, the leagues, the players, the game. All he does is work out and pick winners, two facts made abundantly clear by McConaughey's propensity to walk around shirtless just as often as he makes football picks. I may have rolled my eyes once or twice, but I heard nary a complaint from the ladies in the audience. Except for that one that looked a little like my Uncle Larry.Lang's corruption rests solely on the fragile shoulders of Walter Abrams, a sleazy character played so effortlessly by Al Pacino that you can't help but feel slightly disturbed by the ease with which he seems capable of tainting ambitious young men. Screaming less than usual, Pacino's portrayal is nothing short of an indictment of those sports advisors who feed on the weak. Sports gambling may be illegal in 46 states, but Abrams is well aware that "sports advising" (the politically correct preference, no doubt) is not. Despite the false promise of certainty, sports advising is presented as more used car salesmanship than mathematical study. Figure out your client's needs, and get his money. That's the name of the game. As for actually picking a winner? It's 50-50. A flip of the coin.Sure, Lang is able to compile a pretty impressive hot streak, but what happens when it comes to a crashing halt? The peaks are indeed very high when the fun and money are flowing, but is it worth the lesson learned when your family is threatened and you're hit with the realization of what losing $380,000 can do to a family? Ultimately, the movie would have proved more effective if there had been a greater emphasis on the devastation of the lows of losing. Consequences are touched but never fully realized. 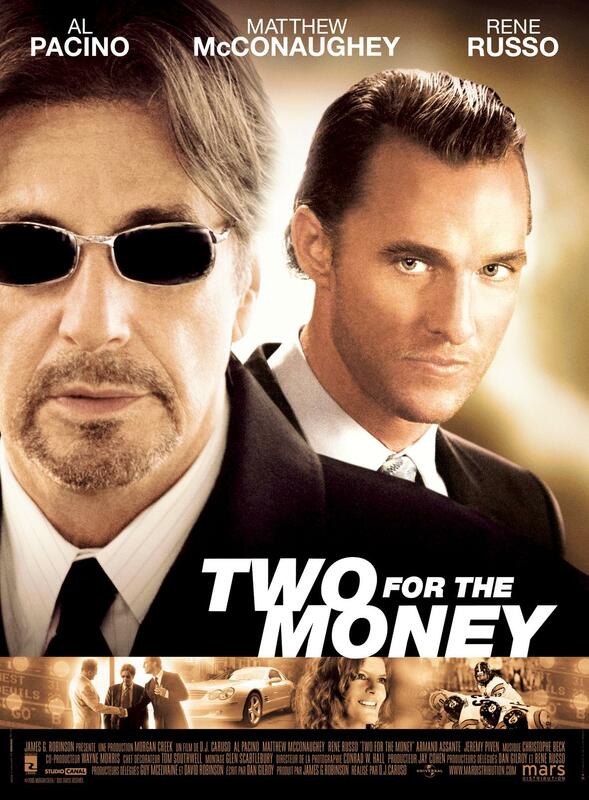 I would have also liked less predictability in a movie about a very unpredictable lifestyle, but Two for the Money still succeeds in giving the audience a glimpse of what gets in the minds of those willing to gamble. Is it about the game? Is it about the money? Or, as Abrams believes, is it about the risk some people are willing to take to feel what they perceive as being alive?The dialogue and character interaction happen at a quick enough pace to grab and seal your attention, and while the last act is somewhat weighed down by the two-hour runtime and the semi-sappy melodrama of plans gone awry, Money still manages to convince the audience to care about whether or not Brandon can get back to where he began - the purity of the game.You want certainty in an uncertain world? Then put your money on obligatory shirtless Matthew McConaughey scenes and Pacino's incisors getting a nice scene-chewing workout. It's a safer bet than trusting your money with the decision-making of those who care more about the profit than they do about you.THE GIST Two for the Money will prove to be most enjoyable to those with some familiarity or interest with sports and the gambling side of the business. 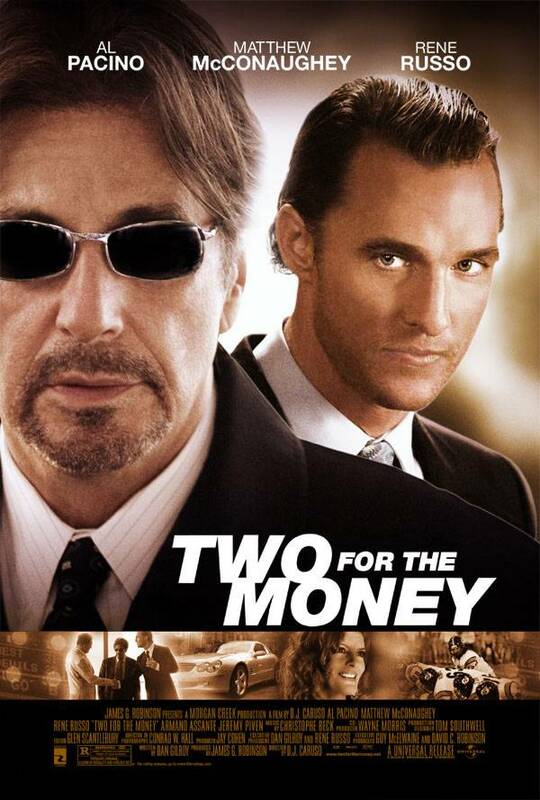 But McConaughey and Pacino deliver enough laughs and energy to make this more accessible to those with little knowledge of the subject matter. If you have your doubts about this one then don't worry about spending the big bucks to see it on the big screen - it'll make for a good rental.